On a very unusually sunny day of October, the group went on a retreat. 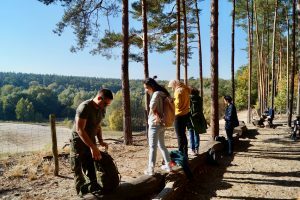 It started with a nice 6 km hike through the Grünewald. 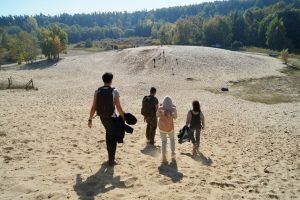 Between conversations and snacks, they were happily surprised by an unexpected and beautiful landscape made of a sand dune and a small lake. At the end of the road the Grunewaldturm was waiting for them, which was greatly appreciated from the outside. 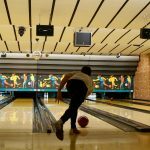 Looking for more fun, the group travelled on the second level of an historic bus towards the next stop: a Bowling place full of experienced people. One could really smell the excitement of the group from far away; each one of them wanted to test how good or bad they were at this sport. The teams were defined by gender, with the mere intention of proving female power. Rules were simple but with a little exception. 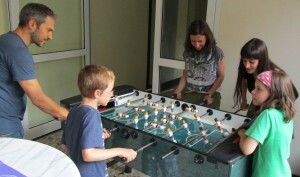 The total amount of points per team was defined as the sum of individual points. Everyone contributed their amount of individual points by a factor of 1, except for Yin, who was under the terrible effects of jet-lag. For her, the multiplicative factor was 1.5. At the beginning they said they were all beginners. However, as time passed by, some professional techniques were elucidated: Julian and his lateral spinning of the ball in order to induce a curved path. Nikolai swinging over and over his dominant arm to accumulate momentum. But undoubtedly, Yin had the most creative technique: a very nice two-hands-between-legs-style. When the hard-fought game was over, the points were summed up according to the rules. As expected, the female team won the battle. Special recognition to Angela and Alireza, who contributed the higher amount of points to their corresponding teams. 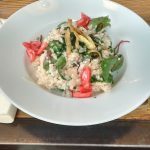 At the end of the day, they went to a restaurant just few steps from ITB to enjoy a delicious dinner. It was a great day for the sysbio-relógio group! 07.12.2017 – Our new paper The Ink4a/Arf locus operates as a regulator of the circadian clock modulating RAS activity is online at PLOS Biology. Check our publications-page for a link to the manuscript and the press-page to know more about our findings. 01.12.2017 – Alireza Basti joined the Relógio group to carry out his PhD project. 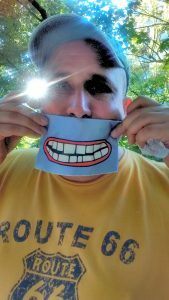 He is financed by the Schwiete Stiftung. Welcome, Alireza! 28.11-29.11.2017 – NG, YL and AR participated in the annual BSIO retreat. YL and NG presented their projects during a chalk-talk session. 26.10-28.10.2017 – REA participated in the Second Add-On Fellow Meeting, Heidelberg. 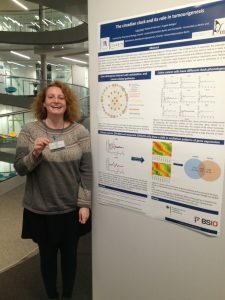 During the meeting Rukeia visited the EMBL core facilities and presented her most recent results on the interplay between the circadian clock and the cell cycle. 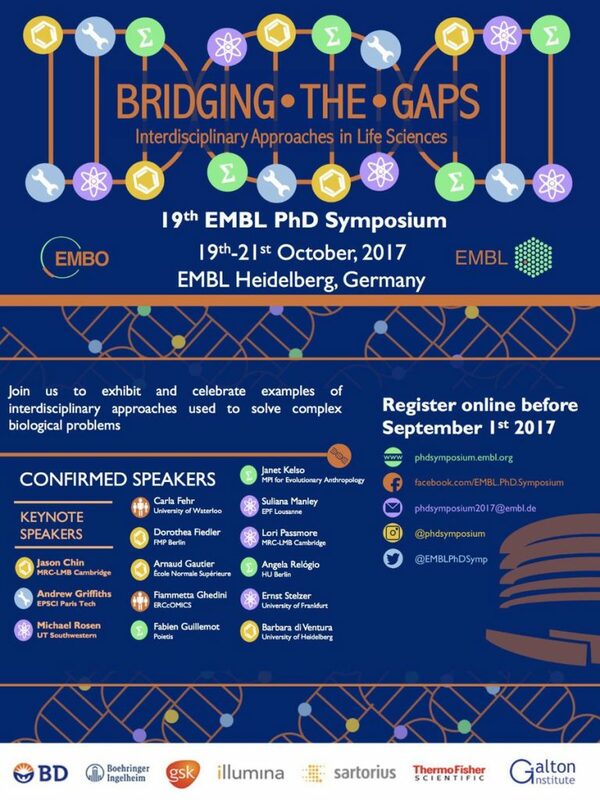 19.10-21.10.2017 – AR was an invited speaker at the 19th EMBL PhD Symposium: Bridging the Gaps – Interdisciplinary Approaches in Life Sciences, in Heidelberg. REA also took part in the symposium with a talk and poster presentation. 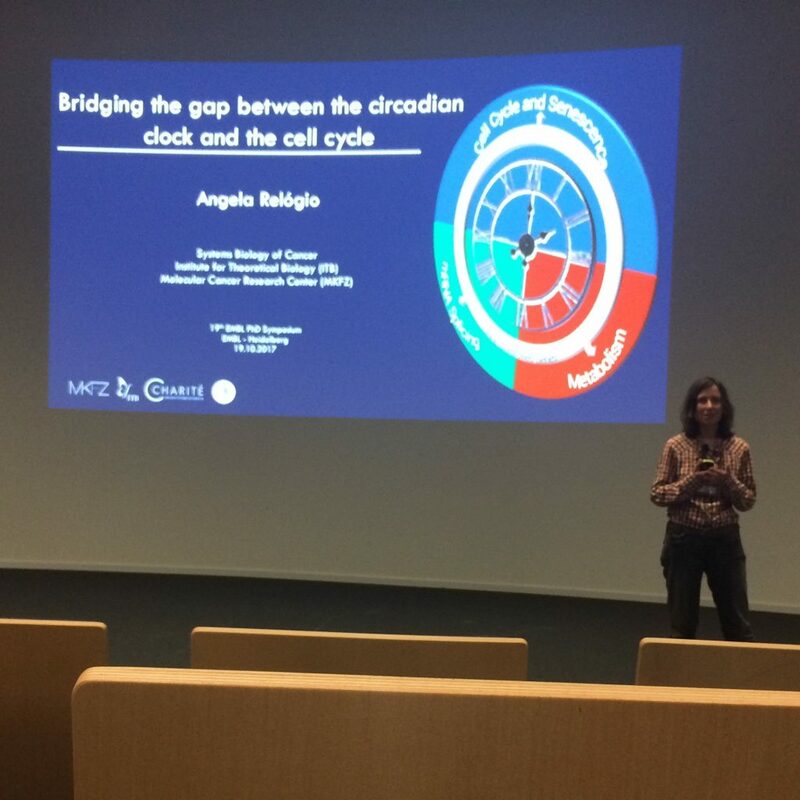 It is always great to be back at the EMBL and a great honour to be invited for the PHD symposium. 5.10.2017 – NG participated with a poster at the International Experimental Biology and Medicine (IEBMC) conference in Croatia. 19.09-22.09.2017 – REA presented a poster at the Conference: ODE Modelling in Systems Biology – Current Methodology and Solution of Application Issues, in Freiburg. 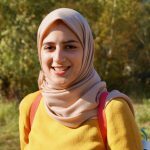 She learned about state-of-the-art methodology for establishing ODE models, and discussed and solved implementation issues as they occur in applications. The group met for a group retreat at Hasenheide Park. The weather was beautiful. 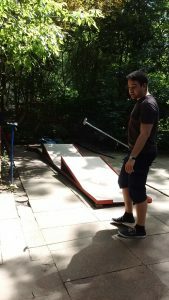 We began with a picnic breakfast in the grass, followed by minigolf at the Hasenheide minigolf. 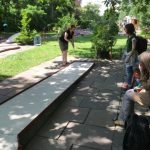 The group was distressed to learn that energetic groups of school children were already occupying the minigolf facilities. 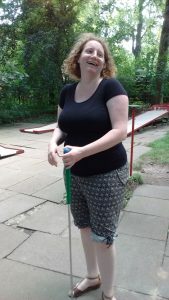 Luckily, the children started to clear up by the time we finished our picnic, and we were able to minigolf in peace. All of the minigolf holes were conquered by everyone except one hole where the golf ball had to go flying into a basketball net. No one was able to complete that hole, but not for lack of trying. 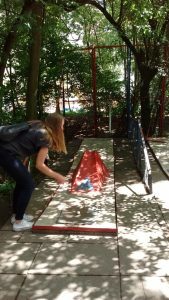 Luise was the minigolf champion, with Mónica just one point behind. Rukeia was the champion of having the most points (an alternative way to decide the winner). 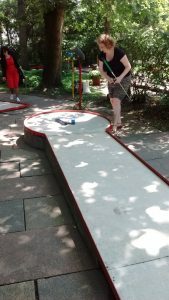 Mónica made many hole-in-ones, and her advice for minigolf success is “just be lucky”. 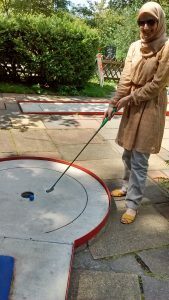 After a grueling round of minigolf, we headed back either home or to the ITB to prepare for the barbeque. 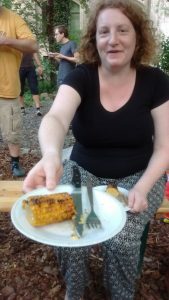 Later that evening, we reconvened at the magic garden behind the ITB for the barbeque. Everyone brought some food for the group to enjoy. The food was delicious and well-deserved after all of the minigolf exercise. It was a lovely day of eating and minigolf. 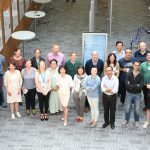 09.07-14.07.2017 – REA participated in the EMBL-EBI Course: In Silico Systems Biology, Hinxton, UK. 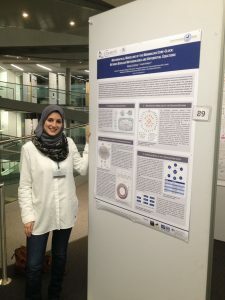 She presented a poster with her preliminary results on splicing and had a chance to learn more about qualitative and quantitative modelling and network analysis. 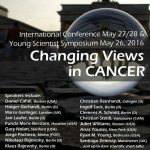 02.06-03.06.2017 – AR, LF, NG, REA participated in the International Conference Sharing radically novel visions in Cancer in Berlin, with one talk and three posters. 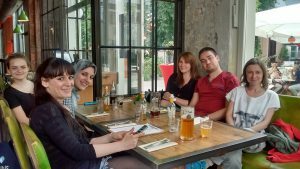 01.06.2017 – LF, NG, REA presented their projects at the Young Scientists in Cancer Research Satellite PhD Symposium -Sharing radically novel visions in Cancer, Berlin. 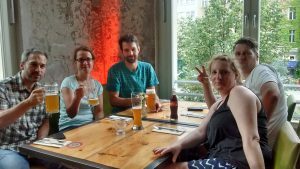 12.05-13.05.2017 – REA participated in the General Fellow Meeting in Hamburg. 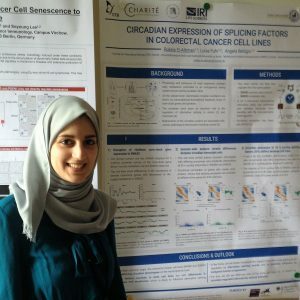 She got a chance to know the Fellows from other programs and presented her work on the circadian-splicing project. The meeting also included a Grant Writing for Scientists workshop and a relaxing tour around the Hamburg Harbour. 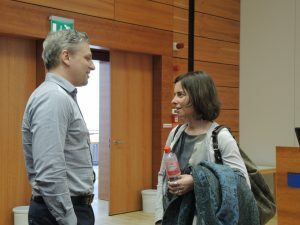 03.03.2017-04.03.2017 – REA participated on the First Add-On Fellow Meeting in Hamburg. 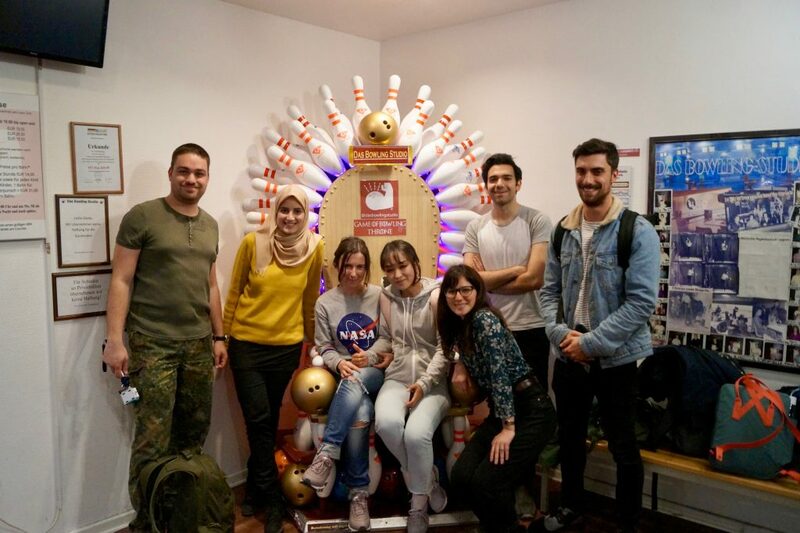 She had the chance to get to know the other Fellows from the Add-On Fellowship 2016, to present her PhD project in a 2-min talk and enjoyed a guided city walk in Hamburg. 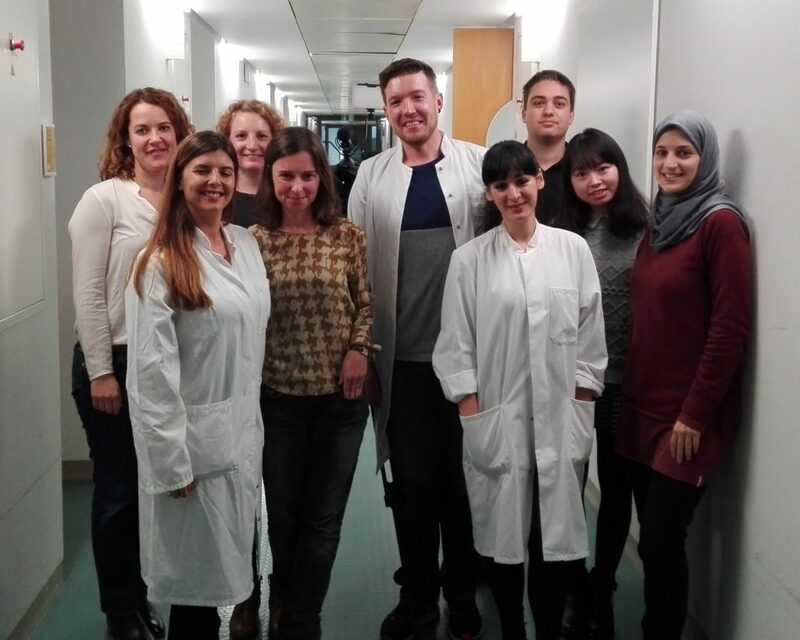 01.01.2017 – Yin Li joined the Relógio group to carry out her PhD project. 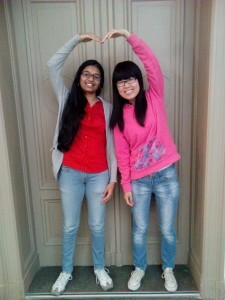 She is financed by the Jinan Huaiyin Hospital of Shandong Province . Welcome, Yin! 16.11.2016 – a team of the RTPi (the international television service of Rádio e Televisão de Portugal, the Portuguese public broadcaster) visited our group and prepared a documentary about our work. The result can be seen at our press page. Many thanks to the journalist Marisa Fernandes and the cameraman Oliver Cloppenburg for the very nice work. 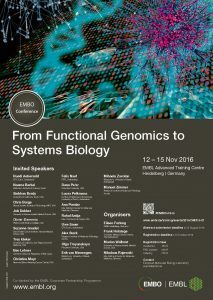 12.11-15.11.2016 – LF and REA presented a poster at the conference “From Functional Genomics to Systems Biology” at the EMBL in Heidelberg. 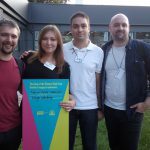 24.09.2016 – NG was part of the winning team at the science hack day in Berlin. Congratulations Nikolai! 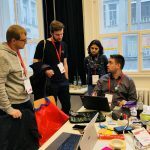 NG and his team developed hardware and software for an innovative device in the health care field which can be wore on the wrist and it measures: pulse; ambient temperature; humidity; UV Light Exposure; visible light exposure and position of the arm via accelerometer. 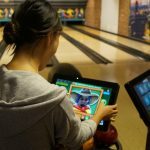 The device has a a Bluetooth interface to connect to the smartphone/tablet/computer and deliver the values in real time. Very useful to measure circadian rhythms in humans, among other applications. 16.09.2016 – REA was awarded the Joachim Herz Add-on Fellowship for Interdisciplinary Science. 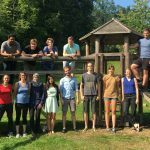 The Joachim Herz Stiftung supports graduate students and postdocs from different disciplines conducting interdisciplinary research in systems biology and neighboring fields. The transition between the two stages is possible during the term of the fellowship (from 11/2016– 12/2018). 06.09.2016 – REA participated in the IRI retreat organized by the PhD students of the IRI graduate school. 06.09.2016 – AR participated in the e:Bio annual meeting in Munich. 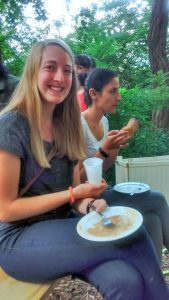 15.07.2016 – After six research-intensive weeks KL completed her internship in the group. 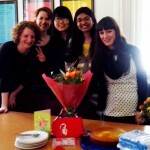 We wish Kirit all the best for the future and hope to see her again for further research and climbing adventures. 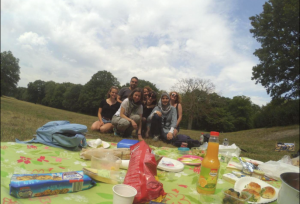 On Friday, July 8th, 2016, the sysbio-relógio group went on a Retreat. 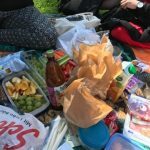 They met at the Volkspark Jungfernheide for a wonderful picnic followed by a day of climbing in the Hochseilgarten and then a thoroughly enjoyed dinner, all carefully planned and arranged by Mónica and Rukeia. 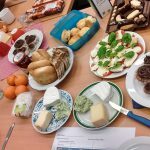 For the feast of a picnic, everyone brought food to share, including delicious chocolate cake, cookies, cheese cubes, juices, sandwiches and salads. Nikolai brought his drone and flew it through the skies of the park as stories were exchanged: their adventures of living in Berlin, their shock after discovering the WG lifestyle when starting University, and their journeys through Europe via train-travel and across the coast of California. 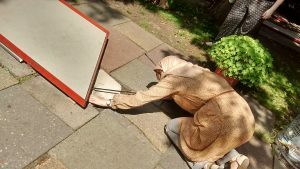 The group then ventured into the Hochseilgarten, stashing their belongings in a large storage bin before being educated on the safety of climbing. 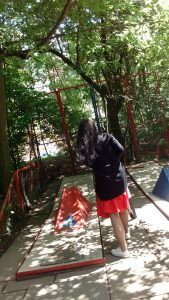 Then they were let free into the dangers of the park – they explored the different paths and discovered that balancing on tree branches wasn’t always as easy as they thought. The group sailed across zip lines and clambered across shaky bridges. Exhausted after three hours, everyone got on the U2 or their bikes to enjoy dinner together at Restaurant Pfefferbräu in Schönhauser Allee 176. 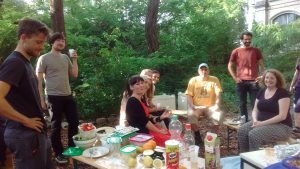 Family and friends joined, as everyone sat together with the beautiful view of Schönhauser Allee, slightly sweaty but very happy to have enjoyed such a nice day together at the retreat. 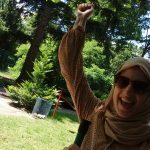 11.07.2016 – AR successfully completed her habilitation and is now “Privat Dozent”. Many thanks to Mrs. Stein and Mrs Thiele from the habilitation office of the Charité, as well as to Prof. Wildemann and all the members of the habilitation commission. 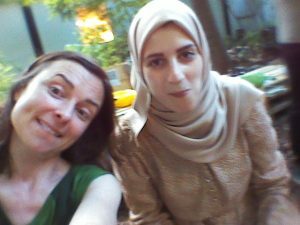 17.06.2016 – AR was a guest speaker at the Lise-Meitner talk-series, Free University in Berlin. 13.06.2016 – REA was selected to participate on the Bioinformatics Summer School, EMBL-EBI Hinxton UK. 07.06.2016 – AR was selected to participate on the EMBL-EBI course on Bioinformatics for Principal Investigators, Cambridge, UK. 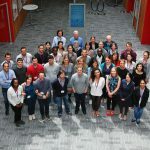 The course was extremely interesting and provided an overview of several tools and platforms within the Bioinformatics extensive field, from data analysis to project management. 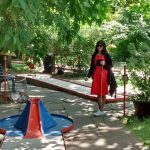 01.06.2016 – Kirit Lempiris joined the Relógio group for a summer internsh ip. Kirit is a first year student from the Princeton University, USA and will stay with us during the next 6 weeks. 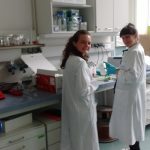 She will develop a project in immunology and the circadian clock and will be co-supervised by Mónica (in the wet lab) and by Rukeia (in the dry lab). 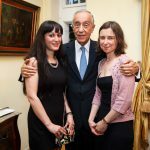 29.05.2016 – AR and MA participated in a meeting in Berlin with his Excellency, the Portuguese President, Prof. Dr. Marcelo Rebelo de Sousa and the Portuguese ambassador, Dr. João Mira Gomes. 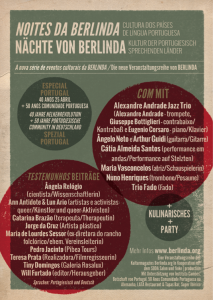 The event took place at the House of Portugal in Berlin with the presence of other guests from the fields of arts, politics, economy and sciences. AR had the chance to exchange ideas with Prof. Marcelo Rebelo de Sousa regarding the scientific landscape in Germany and in Portugal, as well as the current research projects being developed in Relógio’s group. 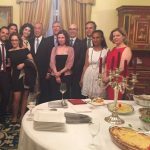 It was a very interesting and enjoyable evening, and we thank the Portuguese embassy for the invitation. 26.05.2016 – LF and NG participated on the MKFZ conference and on the Young Scientist Symposium which took place in Berlin. 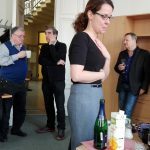 14.05.2016 – JM successfully defended her PhD thesis. 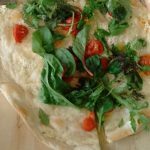 To celebrate, we prepared one of our delicious brunches. 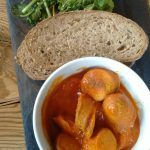 Congratulations to Jeannine, well done! 22.04.2016 – Miguel Godinho Ferreira visited the Relógio Group and gave a MSB talk at the ITB on the The role of telomeres in cancer and ageing. 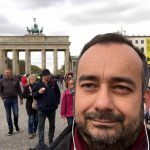 Miguel is a HHMI International Early Career Scientist and heads the Telomeres and Cancer Laboratory at the the Instituto Gulbenkian de Ciência (IGC) and at the Champalimaud Center for the Unknown in Portugal. 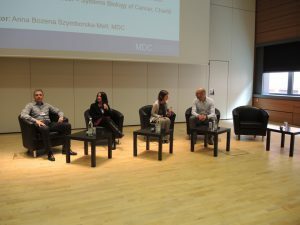 14.04.2016 – AR took part on the career day at the MDC as EMBL alumni, participated on the panel discussion and on the EMBL alumni dinner in Berlin. 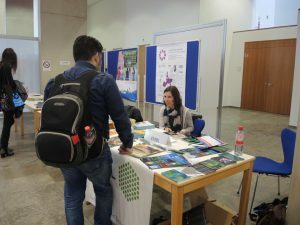 There was also a chance to interact with students, with former EMBL friends and colleagues, to meet old friends like Marta Agostinho, the current coordinator of eulive, and to introduce the EMBL International PhD Programme and Postdoctoral Programme. 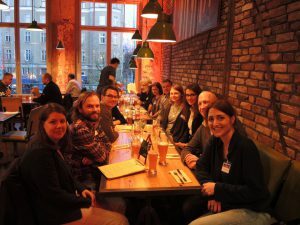 dinner with EMBL alumni in Berlin. 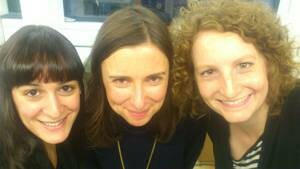 Many thanks to Mehrnoosh Rayner (first on the right), head of Alumni Relations for the great organization of the get-together event in Berlin. 06.04.2016 – Our new paper on Clock-genes and mitochondrial respiratory activity: Evidence of a reciprocal interplay is online at BBA- Bioenergetics. 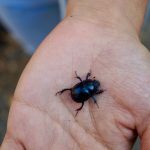 This work was the results of the follow up of a previous collaboration with the group of Gianluiggi Mazzoccoli from the Casa Sollievo della Sofferenza, San Giovanni Rotondo and Nazzareno Capitanio from the University of Foggia, in Italy. 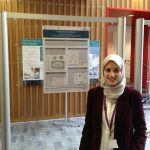 01.04.2016 – Rukeia El-Athman joined the Relógio group to carry out her PhD project. She is financed by the e:Bio-BMBF. Welcome, Rukeia! 22.03.2016 – Angela was accepted as a member of the BIH Young Science. 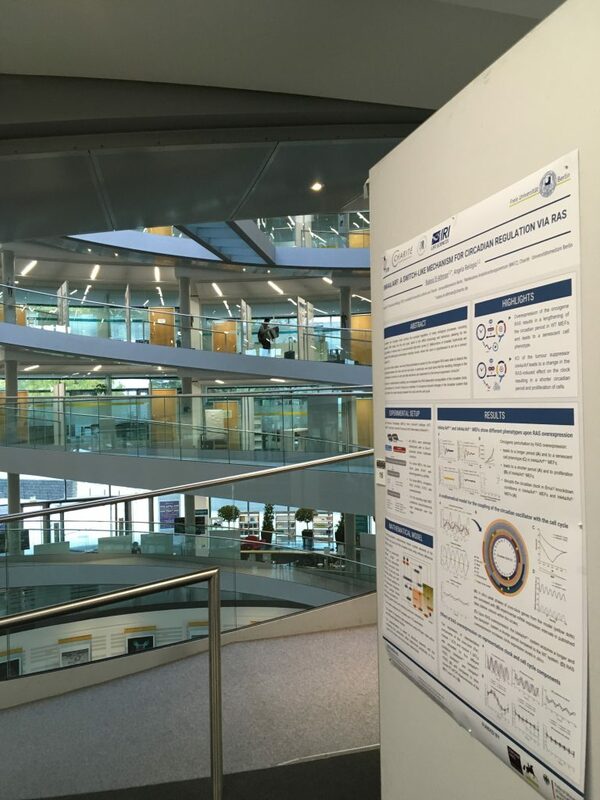 17.03.2016 – NG joined the VIB conference on Applied Bioinformatics in Life Science and presented the work of the group with one poster. 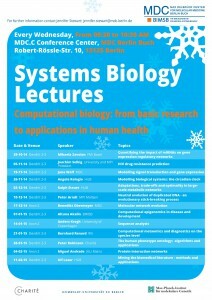 VIB – Applied Bioinformatics in Life Sciences, Leuven, Belgium. 07.03.2016 – NG was selected to participate on the EMBL-EBI course Introduction to Integrative Omics, Cambridge, UK. 03.03.2016 – JM and LF fully equipped to carry out serious experiments. 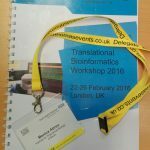 22.02.2016 – MA was selected to participate on the Translational Bioinformatics Workshop 2016 organized by the King’s College London and NHIR Biomedical Research Centre, London, UK. 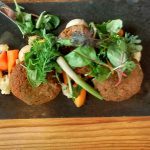 2015 Birthday celebrations – We had a good time in the group during each “surprise” birthday celebration. 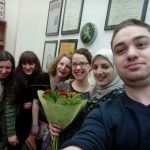 We also had a chance to explore our birthday-songs-singing-abilities in Portuguese for Mónica, in German for Luise, in Chinese for Anuprabha, in Hindi for Angela and in English for Patrick. 28.12.2015 – Our new paper on Clock genes-dependent acetylation of complex I sets rhythmic activity of mitochondrial OxPhos is online at BBA-Molecular Cell Research. This work was the result of a nice and fruitful collaboration with the group of Gianluiggi Mazzoccoli from the Casa Sollievo della Sofferenza, San Giovanni Rotondo and Nazzareno Capitanio from the University of Foggia, in Italy. 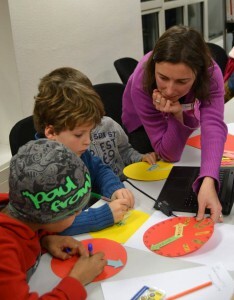 24.11.2015 – AR and MA participated in the native scientist session at the Portuguese embassy in Berlin. This was a great opportunity to teach school children about the circadian clock. The kids loved it and we also. 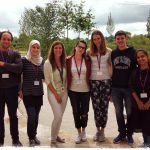 We work with international scientists and teachers to promote science and language learning among school pupils. We focus on pupils who speak a different language at home and in school, and we raise awareness about multilingualism and STEM-related careers. On doing so, we give the opportunity to international scientists to increase the impact of their work through science communication for a better social integration. 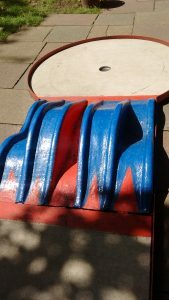 We liaise with universities, schools, embassies, cultural associations, trusts and foundations to deliver Native Schools. 01.11.2015 – Nikolai Genov joined the Relógio group to carry out his PhD project. Nikolai was awarded a position within the BSIO (Berlin School of Integrative Oncology) graduate school. He is co-financed by the e:Bio-BMBF and the BSIO. Welcome, Nikolai! 14.10-16.10.2015 – AR joined, as invited speaker, the 2015 EMBL Postdoc Retreat which took place at Val-Vignes in Alsace, France. Many thanks to the EMBL Postdocs for the nice invitation. 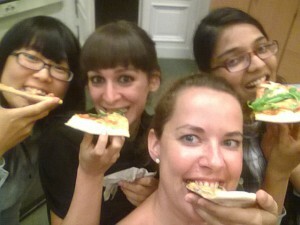 Each year the Postdoc Committee organises a retreat. 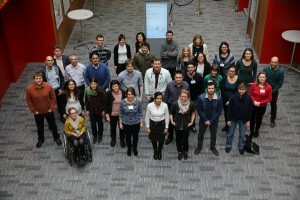 Postdocs from the five EMBL sites get together to exchange ideas, network and form new collaborations. A highlight of the event are the external speakers who are chosen by the postdoc community based upon their scientific excellence. 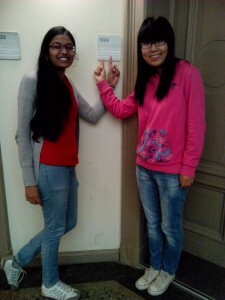 30.08.2015 – Anuprabha and Kayiang successfully completed and defended their masters work. Congratulations to the two and good luck for the future! 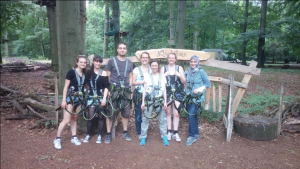 26.08 – 28.08.2015 – MA and AR joined the first retreat of the IRI Graduate School in Dargow, directly at the Schaalsee. 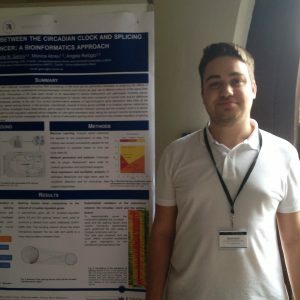 20.07 – 24.07.2015 – MA was selected for the Sleep and Chronobiology Summer School in Oxford. 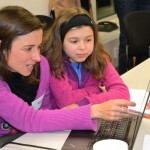 Her participation was financed by the Graduate School of the IRI for the Life Sciences. 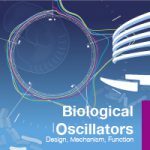 17.07.2015 – Our review on Circadian systems biology: When time matters is online by the Computational and Structural Biotechnology Journal. 01.06.2015 – Orlando Quintanar Haro joined the Relógio group for an internship within the Masters in Molecular Medicine of the Charité. Welcome, Orlando! 06.05.2015 – The first publication of the group on the Assembly of a Comprehensive Regulatory Network for the Mammalian Circadian Clock: A Bioinformatics Approach is online by PLoS One, congratulations to all co-authors. 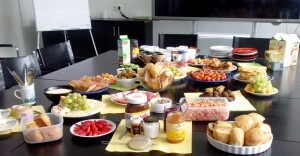 06.05.2015 – Our group organized a lab-warming brunch at the MKFZ. Delicious! 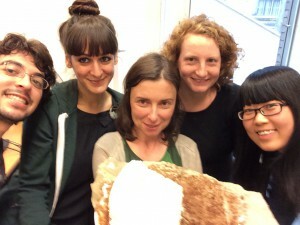 01.05.2015 – Julia successfully concluded her internship. Good luck for the future! 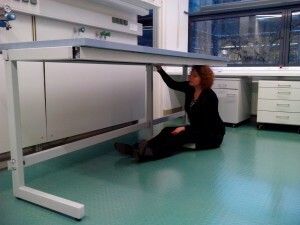 01.04.2015 – Jeannine Mazuch joined the Relógio group as a research assistant. Welcome, Jeannine! 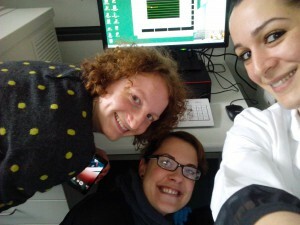 15.03.2015 – The first circadian measurements in our lab! Many thanks to Thomas Wallach, AG Kramer. 03.02.2015 – Kaiyang Zhang joined the Relógio group for her Masters work. 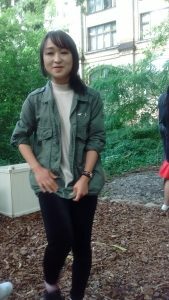 Kaiyang is a student from the Erasmus Mundus (euSYSBIO) program. 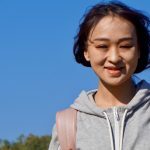 Welcome, Kaiyang! 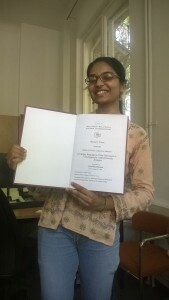 05.01.2015 – Anuprabha Bhargava joined the Relógio group to carry out her Masters work. 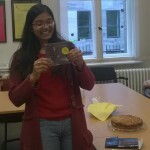 Anuprabha is a student from the Masters in Molecular Medicine program of the Charité. 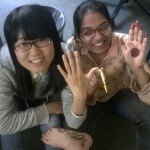 Welcome, Anuprabha! 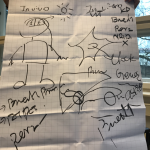 12.2014 – Our group in 2014! 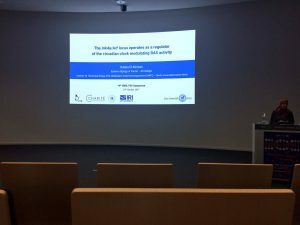 26.11.2014 – AR gave a lecture on modelling the circadian clock as part of the Systems Biology Lectures 2014/2015 at the Berlin Institute for Medical Systems Biology –BIMSB, Berlin. 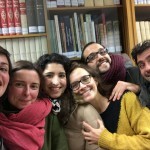 17.11.2014 – Mónica Abreu joined the Relógio group to carry out her PhD project. 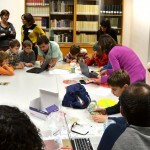 Mónica is integrated in the Graduate School of the IRI for the Life Sciences. She is financed by the e:Bio-BMBF. Welcome, Mónica! 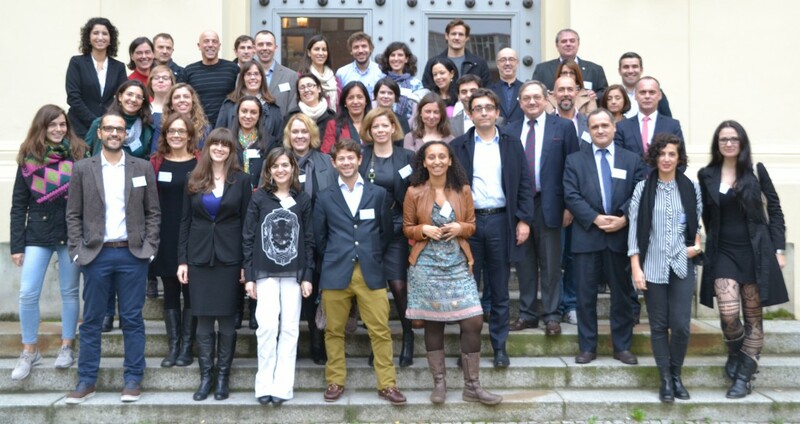 15.11.2014 – AR attended the annual meeting of the Portuguese association of academics in Germany ASPPA – PORTAL 2014. 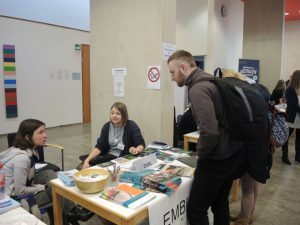 The meeting took place at the Humboldt University in Berlin and addressed important aspects related to the emigration of the Portuguese language and culture (“A Emigração da Língua e Cultura Portuguesas”). It was also an important event for exchanging ideas between the participants. Congratulations ASPPA for the successful meeting and the excellent organization! 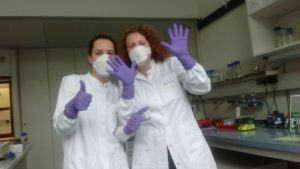 05.11.2014 – Julia Philipp joined the Relógio group for an internship within the Masters in Molecular Medicine of the Charité. Welcome, Julia! 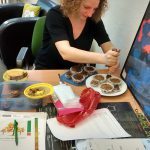 03.11.2014 – Luise Fuhr joined the Relógio group to carry out her PhD project. 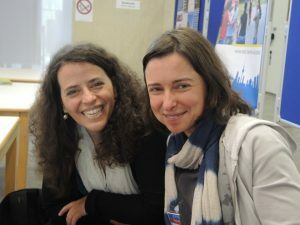 Luise was awarded a position within the BSIO (Berlin School of Integrative Oncology) graduate school. She is co-financed by the e:Bio-BMBF and the BSIO. 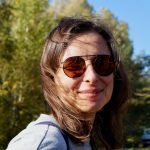 Welcome, Luise! 22.09 – 23.09.2014 – AR took part in the annual status seminar of the e:Bio Innovation Competition in Systems Biology. 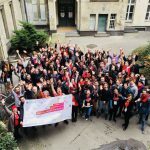 This event took place in Berlin (Charité Campus Virchow Klinikum), and joined all groups which are financed by the eBio initiative. 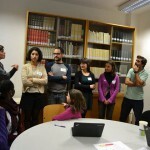 The groups involved could present and discuss their projects and closely interact with other colleagues. It was very interesting to hear about the different projects. In particular, it was impressive to see the broad range of questions which is being addressed with systems biology approaches. 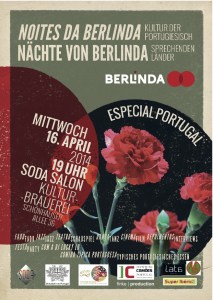 16.04.2014 – AR took part in the Noites da Berlinda – ESPECIAL PORTUGAL. Uma noite de espectáculos e entrevistas com artistas e personalidades da comunidade portuguesa em Berlim.